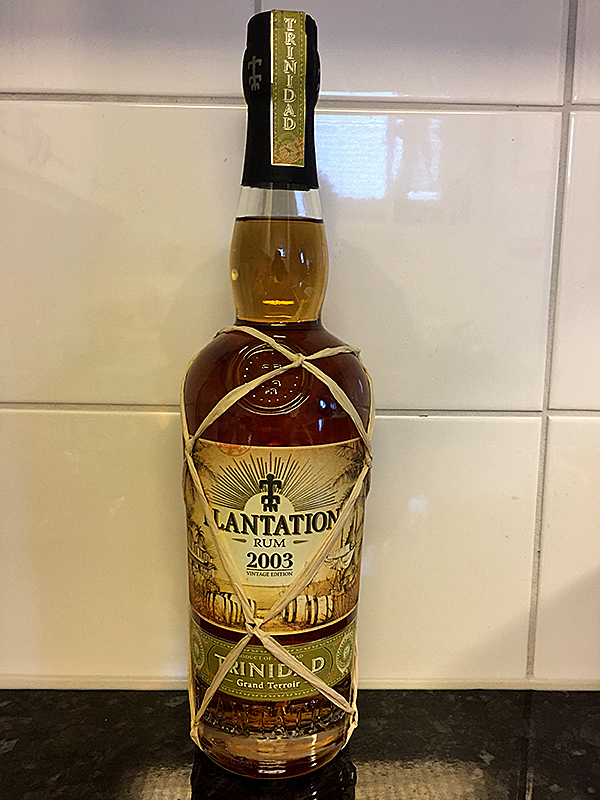 Have you found an online vendor selling Plantation Trinidad 2003? The Plantation Trinidad 2003 comes in a traditional Plantation bottle with the ribbons around it (picture). This is a nice price worthy rum that you can drink neat aswell as doing cocktails and drinks with the Plantation Trinidad 2003 as base. On the nose you get some alcohol and a fresh fruit with a little bit of vanilla and maybe also a hint of Bourbon from the casks. This rum smells a bit different from other rums I have tasted. Not so much sweetness in the aroma. In mouth you get fruit, spices and oak. Some sweetness but not very sweet. This rum is smooth in the throat. The aftertaste is intense with lots of spices and oak. The aftertaste is not the best for me. Not one of the best rums but it is a nice rum compared to other rums in the price range. Denna är nog förmodligen den bästa plantationromen, oerhört prisvärd vilket drar upp betyget en aning. Nyanserad smak av arrak och citrusfrukter, något annorlunda jämfört med andra från plantation vilket gör att den sticker ut och gillas skarpt! It’s quite good. I really don’t have something bad to say about it. But I think Plantation (and also some others) is a little bit dull. I mean if I for example want a rum from Trinidad or Jamaica on my shelf I buy a rum from the original distillery. My first good Rhum, vanilla is the first aroma that i notice, smooth tasting and leaves you wanting more. Going to enjoy !!! This one is great. Better then the XO. Great, clear flavours. Not bad, but lacks character. Good value for the price. Very different taste between first and second sip. Sip after sip was better and better. The best one was the bitterness when you push the rum at the back of your tongue. Nose: pineapple, vanilla and cinnamon. Also the hint of a cold cigar. Body: citrus, vanilla, some cocos, ginger and also the taste of cake. All in all nicely balanced from my point of view. At first it felt a bit too alcoholic but aftet few sips my tongue got used to that and only well balanced taste remained. It has been while since i tasted this rum so i have to refresh my memory. In the nose it was mostly fruity, slight citrus and vanilla. On the palate it had nice balance of flavours, fruit and oak and slight vanilla. The sweetness was little bit on the dry side. Finish was medium long and slightly dry but didnt really develop much interesting flavours to palate. Overall nice well rounded rum but little too safe for my tastebuds. Didnt try this in cocktails. Lite skarp i eftersmaken men en rom man inte tröttnar på. Inte för söt. Erstaunlich wie Zeit und Temperatur diesen Rum wandeln. Düfte von Gebäck und Vanille treten jetzt hervor auch etwas Rauch ist dabei, ganz dezent. Amazing how time and temperature change this rum. Fragrances of pastry and vanilla are now emerging, and there is also some smoke, quite subtly. A bit boozey smell initially but once you get past that it's a delightful rum. This is a nice vintage edition. From the first sip you can feel the intense frutty aromas of pear and mango, perfectly complimented by lightly pepered woody notes. The aftertaste is well balanced, quite lasting, it leaves you wishing for more of it. I have just started to collect plantation rums. This is my third buy. This one is quite different in taste and smell compared to my other two (barbados grand reserve and the 20th anniversary.) Citrus and vanilla stands out in a smooth smell. The taste is a bit sharper in the beginning then my two other plantations and with a longer smooth finish. A bit like the angustura 1919 but more balanced. Sherrynotes with citrus and vanilla, a bit closer to a fine smooth fruity whiskey in flavour. Great rum if you want something different in taste compared to the more classic rum flavours. The price is reasonable. Maybe it was the competition but I had hoped for more. Clear citrus aroma. Nice hints of citrus and arrak and vanilla and nice cask flavors. This rum is very smooth and has a nice aftertaste. A good rum for everyday but is doesn't have enough depth for me to become my favorite. Dost nezvykle laděný Plantation. Chuťově má nejblíž k rovněž trinidadskému rumu Angostura 1919, ale ta podivná pomerančově-kořeněná vůně i chuť, která u Angostury tvoří monolit, připomínající až jakýsi žaludeční likér, je zde rozvinuta do daleko pestřejší chuťové mozaiky. Hrušky, mandle, popcorn ani papriku inzerované na etiketě v tom sice necítím, ale musím připustit, že s trochou dobré vůle by se v tom určitě dalo najít skoro cokoliv. To "cokoliv" arci především zahrnuje zjemňující efekt ferrandských sudů od koňaku, a v druhé řadě polymorfní ovocnou svěžest. Další láhev si sice nejspíš už víckrát nekoupím, ale jsem moc rád, že jsem mohl vypít tuhle, jelikož mi ušetřila další experimenty s Trinidadem. Podobně jako u Angostury byla na mě výraznost chuti příliš razantní, takže celkem vzato i v tomto případě šlo jen o občasnou zajímavost, nikoli o flašku, s níž by se dal strávit příjemný večer.